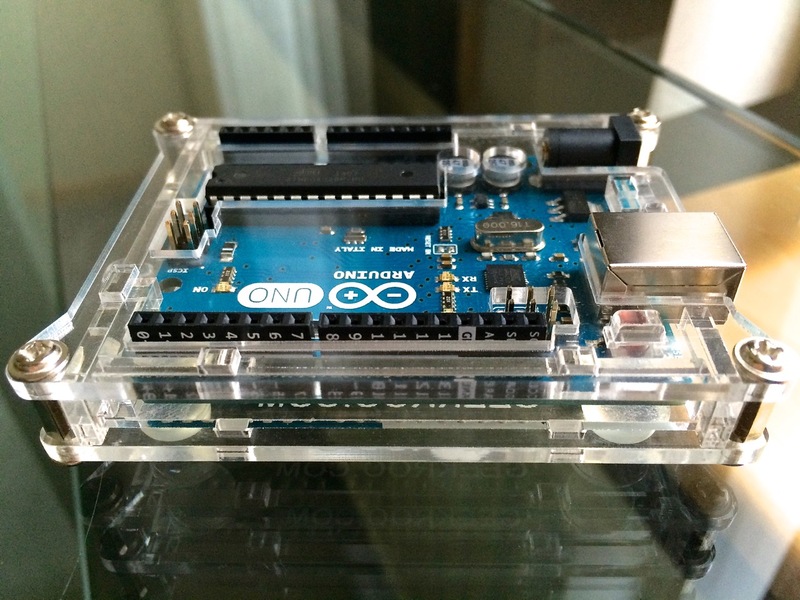 My Arduino Uno permanently sits on my desk, next to a breadboard housing my current project. Any projects that move on to the protoboard/stripboard stage get their own standalone ATmega328, leaving my Uno available for a new project. It will never get embedded in any kind of project enclosure, so I need a case to prevent dust and dirt from accumulating on top of the board. Of course it also has to look good, and provide access to all of the pins and headers. It was refreshing to receive a shipment in a sturdy cardboard box, instead of the usual padded envelope. Geekroo definitely knows how to securely ship small plastic parts that otherwise could easily get damaged on their way here. The package also contained a neat sticker with their geeky kangaroo logo, which I’m sure I’ll find a good home for. 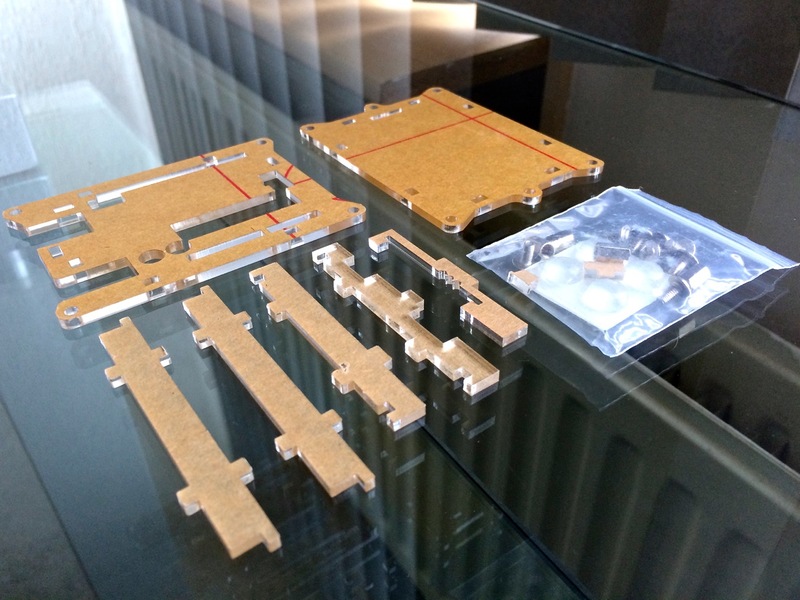 The acrylic case comes as an unassembled kit, with laser cut parts, metal screws and spacers, and four non-slip adhesive rubber feet. The package didn’t contain instructions, and I couldn’t find any online, so I had to figure out how to assemble the case on my own. There aren’t that many parts though, and besides the two identical long sides, they all have unique shapes that only fit together one way. I managed to put the case together without too much effort. I probably spent more time peeling the paper film layer off the parts. Once assembled, the case looks beautiful. There are no markings on the top layer. The bottom layer is engraved with the Geekroo logo and their website, but it’s subtle and unobtrusive, and I normally won’t notice the bottom side anyway. 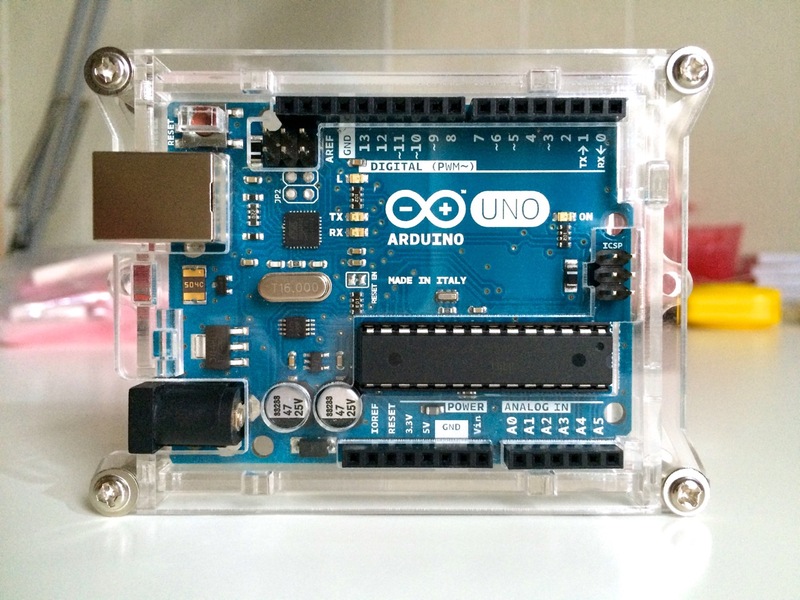 The enclosure has a tight fit, securely protecting the Arduino on all sides with thick plastic. The parts interlock, and are held in place with eight screws, two per spacer. The top layer sits lower than a regular box-shaped case, with cutouts for the pins, headers and the taller components. The clear acrylic material makes it easy to read the pin names, and see all of the LEDs. The case even comes with an acrylic cap that acts as an extended reset button, poking through a cutout above the switch. I’ve seen other cases that require you to push a paperclip through a tiny hole to reset the device. This feels a lot better. Any good alarm clock needs an FM radio tuner. I realize DAB+ or online audio streams would be better options for a modern radio, but I want to keep things simple and basic for now. After all, this is still mostly about learning and experimenting, and an FM radio tuner is probably a lot easier to figure out than the latest digital technology. 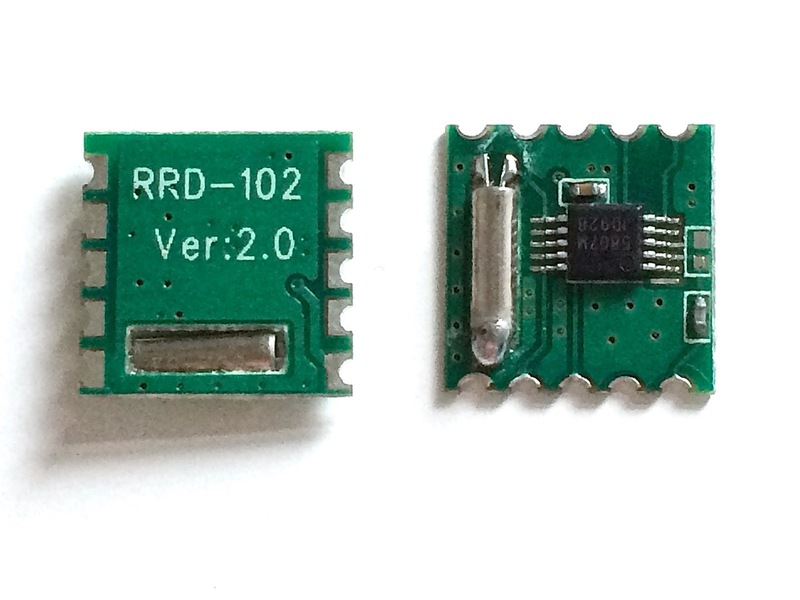 This RRD-102 module contains an I2C compatible RDA5807M FM radio tuner, which is very similar to the TEA5767 I also have lying around. The main difference lies in the number of external components. While the 5767 needs a lot of bits and pieces for a minimal working circuit, the 5807 hardly needs any additional parts to function properly. Once I get around to devoting more time to my alarm clock project, I will do a thorough comparison of both FM tuners. 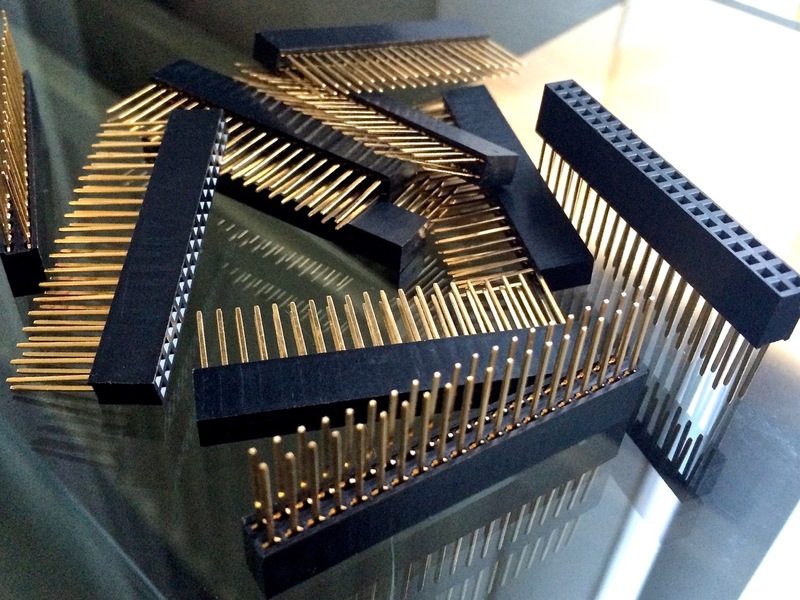 The 2×20 stackable headers are meant for my Raspberry Pi B+. As you may remember, I bought a case for my Pi a few weeks ago. Unfortunately my breakout cable didn’t quite fit, which I solved by adding on some stackable headers. I first tried a set of 8 and 12-pin headers, but two of those headers can’t fit next to each other on the same row. These new 2×20 headers are a much better solution. They’re a perfect fit, and allow me to use all 40 pins. 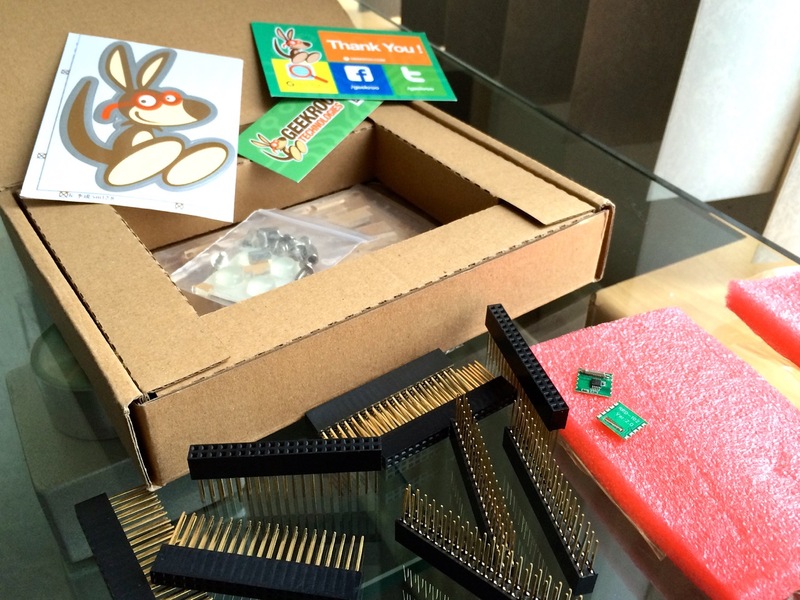 The problem with shipping headers with long pins in a simple bubblewrap padded envelope is obvious from the photo. The pins can get rather bent while they’re in the mail system. I’ll have to properly straighten them first before any kind of connector will fit.